Snails are a type of mollusc with a coiled outer shell that provides protection from harsh weather and predators, such as birds, rodents and amphibians. Snails are born with their shells, which are soft at birth but continue to grow larger and stronger as the snail grows in size. The consumption of calcium also helps strengthen a snail's shell. Land snails, sea snails and freshwater snails comprise some 43,000 known species. Wherever they live, all snails must come out of their shells to find food and reproduce. A snail's environment determines whether it will come out of its shell. To avoid freezing or drying out, some snail species hibernate during cold winter months or droughts, slowing their heart rate and sealing their shells with mucus. Snails are also nocturnal and avoid exposure to sunlight. A land snail is only able to come out of its shell when the environment is warm and moist, conditions that allow it to glide along surfaces. You are most likely to find a snail at night, on cloudy days or after it has rained. Under those conditions, the snail may exit its shell and produce a slimy mucus that helps it move safely from one area to another. Snails come out of their shells to search for food. Different species have different food preferences, which can include plants, fungi, vegetables and other snails. A snail’s tentacles have olfactory neurons that provide it with fine senses of smell and taste, allowing it to find food. Snails also use their olfactory neurons to find slime trails left behind by other snails, which might lead to feeding areas or protective resting environments. But the carnivorous predatory decollate snail (Rumina decollata), follows a slime trail in search of other snails to eat. Sexually mature snails come out of their shells to find mates and engage in mating rituals, which can last from several hours to half a day. Most snails are hermaphrodites, which means they have both male and female reproductive organs. Before mating, snails sometimes cover each other in mucus. 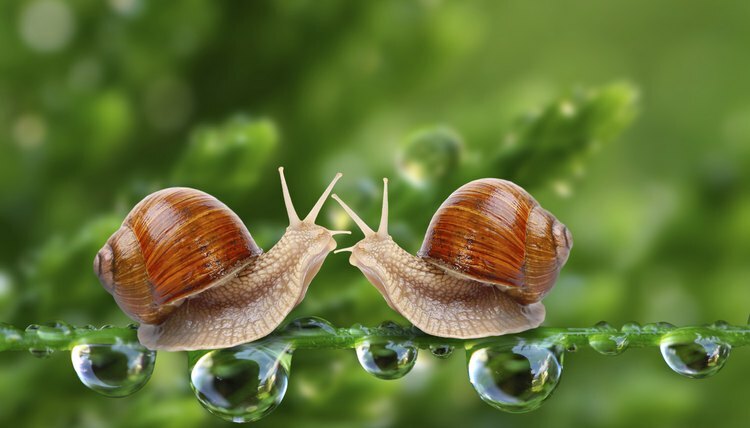 After doing so, the two snails fertilize each other, allowing both of them to reproduce. Some hermaphroditic snail species can even fertilize themselves without a partner. Once a pregnant snail’s eggs are fertilized, the snail must leave its shell to find a suitable place to deliver them. Depending on the species, a snail can hold several hundred eggs. These eggs are small and must be deposited in a warm, moist environment that is free from danger. Once a snail delivers its eggs into moist soil, it can take several weeks before the newborns hatch. Whenever a snail comes out of its shell, it is vulnerable to predators, such as large insects, birds, snakes, amphibians, rodents and other snails. Snails move slowly and are easy targets for hungry predators. When under attack, a snail's best defense is to retract into its shell. Some predators, however, are able to break through a snail's shell, leaving it defenseless. A snail's best chance of survival is to reduce the amount of time it spends outside its shell and settle in protected areas. Mental Floss: Are Snails Born With Shells?